Tiger Rockfish (Sebastes nigrocinctus), an inhabitant of rocky reef and boulder habitat of the northeast Pacific Ocean from Alaska to California, can reach an age of more than 100 years. This photograph was taken while scuba diving in Barkley Sound, Vancouver Island, British Columbia, Canada. Waiting to ambush a prey, a Lingcod (Ophiodon elongatus) rests on a rocky reef In Barkley Sound on Vancouver Island, British Columbia, Canada. Aspect ratio = 1:1. The China Rockfish (Sebastes nebulosus), is one of more than 60 congeners distributed along the Pacific coast of North America. The China Rockfish is a territorial shallow water demersal species. This specimen was photographed while scuba diving in Barkley Sound, Vancouver Island, British Columbia, Canada. 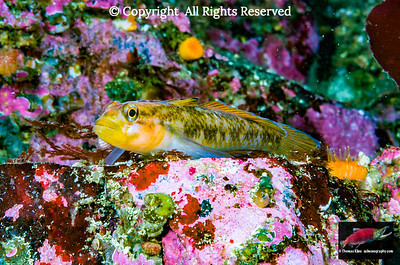 Painted Greenling (Oxylebius pictus ) resting on a rocky reef in Barkley Sound, British Columbia, Canada. Aspect Ratio = 2:3. Painted Greenling (Oxylebius pictus ) resting on a rocky reef in Barkley Sound, British Columbia, Canada. Aspect Ratio = 1:1. 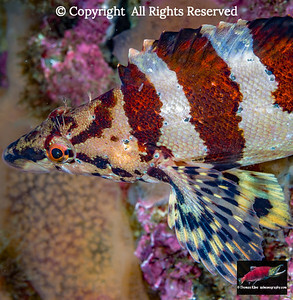 Quillback Rockfish (Sebastes maliger), which are distrbuted along the Pacific coast from Alaska to California, are named for their long and venomous dorsal fin spines. 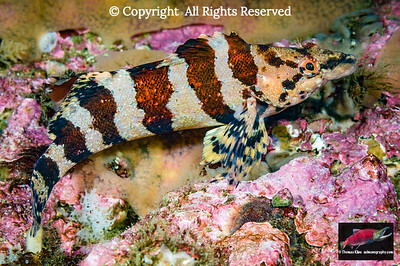 Blackeye Goby (Rhinogobiops nicholsii). Aspect Ratio = 3:4. 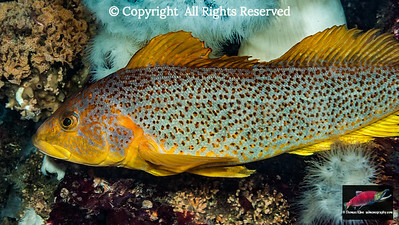 Copper Rockfish (Sebastes caurinus.) is a shallow demersal (about 10 to 200m or 30 to 600 ft depth) species that ranges from Alaska to Baja California. They can be a half century old. This photograph was taken with a Nikon D2X camera in a Seacam underwater housing while scuba diving in Barkley Sound, Vancouver Island, British Columbia, Canada. 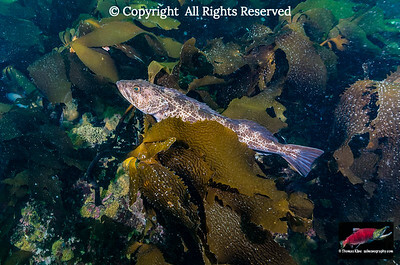 Female Kelp Greenling (Hexagrammos decagrammus). Black Rockfish (Sebastes melanops). Aspect Ratio = 2:3. Black Rockfish (Sebastes melanops) with a parasitic copepod with twin egg cases on a dorsal fin spine. Aspect Ratio = 2:3.